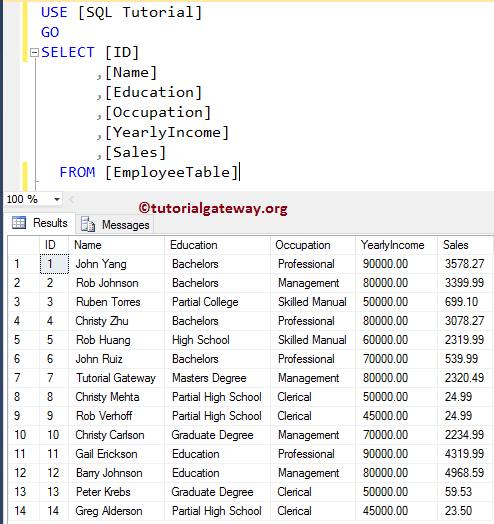 The SQL INSTEAD OF DELETE trigger is fired before the execution starts. So, you can use this trigger to store the values in another table before the delete option, or perform some operation, or deleting different table etc. 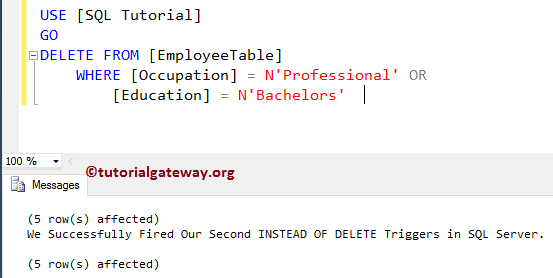 In this article, we will show you, How to write the INSTEAD OF DELETE Triggers in SQL Server with an example. TIP: You can refer INSTEAD OF INSERT Triggers in SQL Server article to understand the INSTEAD OF INSERT Trigger, and INSTEAD OF UPDATE Triggers in SQL Server article for INSTEAD OF UPDATE Trigger. Employee Table Audit also holds the same 14 records, along with the Server Instance name, Server name, and Insert Time (Audit Information). 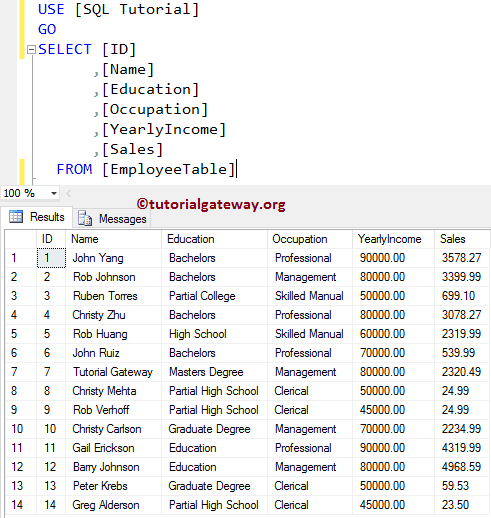 In this example, we will show you, How to create an Instead of delete Triggers in SQL Server. 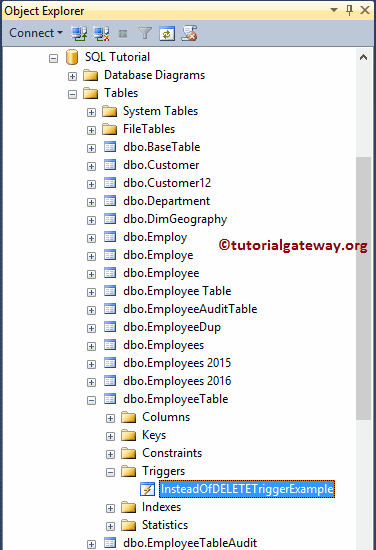 For instance, if you want to restrict the users from deleting the records in the original table, and you want those logs in another historical table then you can use this trigger. Here, we will create a trigger on the Employee table using the CREATE TRIGGER Statement. 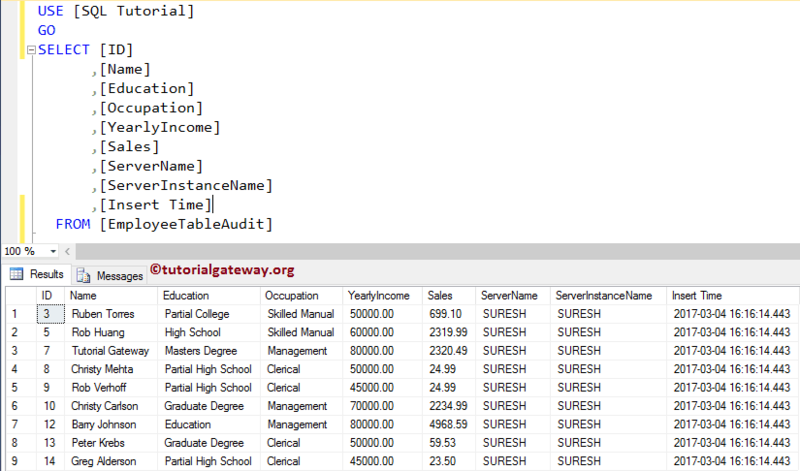 From the below code snippet you can see that we are using the MERGE Statement to select all the records that you want to delete from the Employee table, and then We are deleting those records from the Audit table. It means when the user deletes any Employee table record then trigger will delete those records from the audit table, and kept the Employee table unchanged. For the demonstration purpose, we are deleting all the records in the Employee table whose Occupation = Professional, or Education = Bachelors. Though we performed delete operation on the Employee table. As you can see from the above screenshot, our Employee table is unchanged. 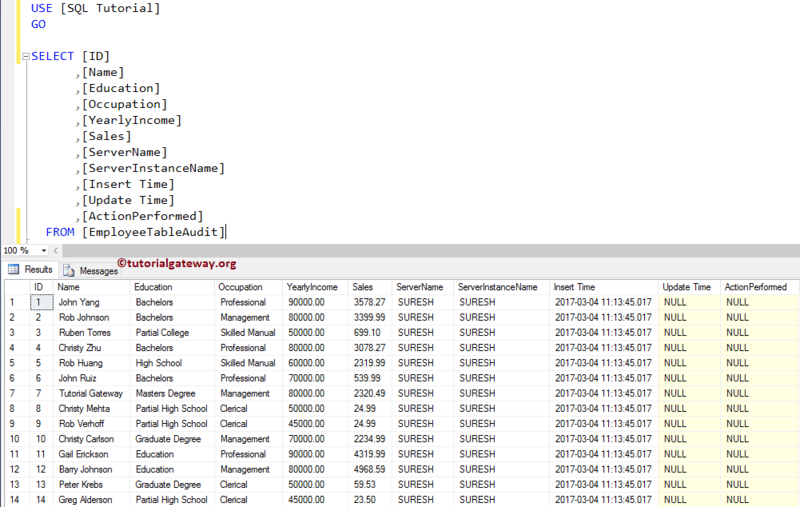 Next, check the records in the Employee table Audit using the following query.